When Joselin Linder was in her twenties, her legs started to swell. She thought little of it, until her health problems started to compound in ways that baffled her doctors. Diagnosed with extreme liver blockage and dangerous levels of lymph fluid, Joselin turned to the most similar case she could think of—her father’s. Joselin compared the medical chart of her father—who had died of an undiagnosed disease, ten years prior—-with that of an uncle who had died under similarly strange circumstances. Delving further into the past, she discovered her that her great grandmother had symptoms like hers, and she recognized that she was dealing with something more than a fluke. Whatever had killed her father, uncle, and great-grandmother was likely genetic, and the clock was ticking for the family members of her own generation. Setting out to build a more complete picture of the disease that haunted her family, she approached Dr. Christine “Kricket” Seidman, the head of a group of world-class genetic researchers at Harvard Medical School and a colleague of her late father’s, for help. Dr. Seidman has been attempting the map the faulty gene for seventeen years and has confirmed not only that Joselin’s symptoms are genetic, but that Joselin’s family is this disease’s founder population—a group of people experiencing the baffling symptoms of a brand new mutation. Here, Joselin she tells the story of their gene: the lives it claimed and the future of genetics it foretells. 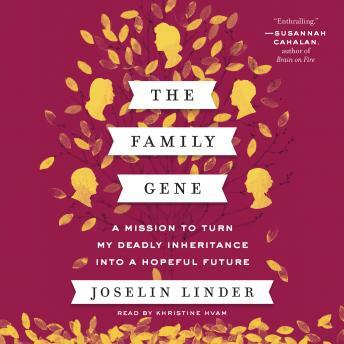 Digging into family records and medical history, interviews with family and friends and her own experiences with Harvard doctors, Joselin pieces together the story of a deadly gene to write a gripping and unforgettable exploration of family, history, love, and mortality. A compelling story of survival and perseverance, THE FAMILY GENE is an important story of a young woman reckoning with her father’s death, her own mortality, and her ethical obligations to herself, family, and society.